We work with several companies of transport to offer the best service to our clients. In the Spanish territory, Nacex is the company whot makes the services of transport, and also in the peninsular Portuguese zone. For the international sending, we work with DHL Express for express services and with UPS Standard for most economic services in Europe. All the sending goes correctly enveloped and protected, to avoid possible damages during transport. In addition, they all are assured before theft, loss and break. The transport companies we work with, only works from Monday to Friday. They don´t make any deliver or transport Saturdays or Sundays or festive days. · The orders realized before them 16:30h and whose payment is confirmed, are sent the same day. · It is necessary to indicate an operative telephone in order that the agency of transport could contact with the client if necessary. · If the client is absent, the agency of transport will happen to distribute the following day again. One recommends to indicate a direction of a relative or of his company, to assure the delivery. · Some ZIP codes can cause delays foreign to our will. · Service Nacex 24/48h - Unlimited Weight (Flat Rate). With follow-up web route. · Service Nacex 24 hours - From 2 to 10 kg. With follow-up web route and SMS. · Free shipping - If some product of your order have free postage and handling (it will be indicated in the card of the product), the whole order will be sent without any cost, or equally if your order exceeds the cost that makes a promotional "Free Shipping". This is valid only for Spain and Portugal (island´s territories not include). The sending will be realized by the service 24/48h of Nacex. With follow-up web route. 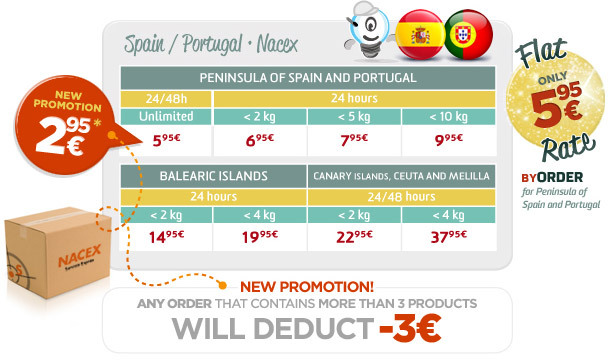 · Service Nacex 24 hours -From 2 to 4 kg (The sending to Formentera can be delayed 48h by reasons foreign to UniversOriginal). With follow-up web route and SMS. 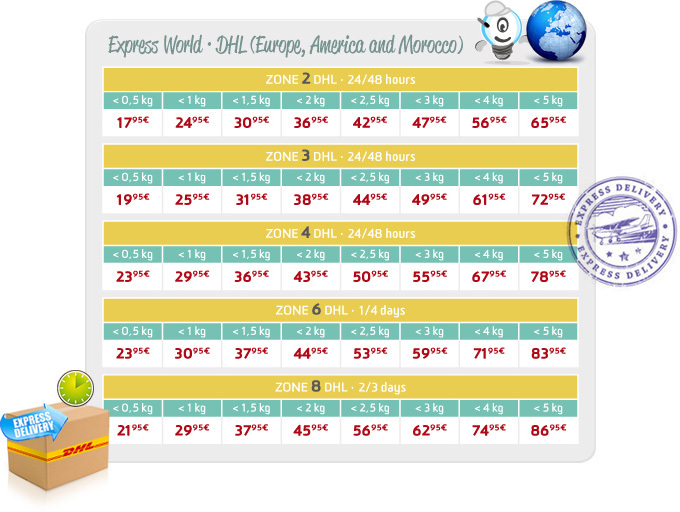 · Service Nacex 24/48h - From 2 to 4 kg (the delivery can be delayed on the term by customs ro frontier negotiations. It is possible that it has a few expenses of customs which quantity depends on the destination of the package. These expenses always are chargeable to the client. Invoices below 10 € do not have charges extra in Customs, if this amount is up to 10 €, normally it will cost between 15 and 25 €). With follow-up web route. · The orders realized before 13:00h and whose payment is confirmed, are sent the same day. · Consult prices upper weight. · It is necessary to indicate an operative telephone in order that the agency of transport could contact if necessary. 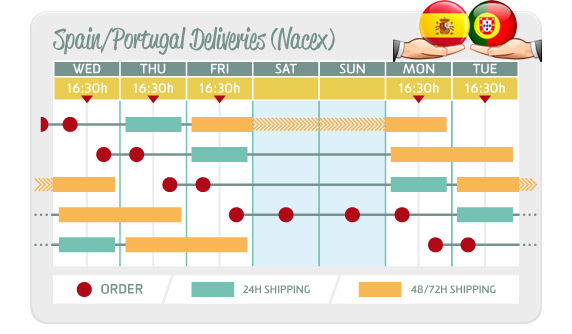 The orders realized before them 13:00h (for sending with DHL or UPS) and of them 16:30h (for sending with Nacex) and whose payment is confirmed, they are sent the same day. You should know, that if you buy articles which availability is "Soon" or "Out Stock", the order will send when all the articles are available. (So to the time of the sending you must add the time of the availability of the articles, always if they are not with availability " In Stock "). If you want to receive before one article and another one that had a major delivery time later, will have to do it in two independent purchases. · In Stock - Immediate Sending. · Soon - If it is indicated, reservations will be able to be realized. · Out Stock - Without Stock. To guarantee the quality of the delivery service, it´s very important that client give us an operative telephone in which the carrier could contact him. The delivery will be effected on the direction indicated by the client. From receiving our notification that we realized the sending, the client could contact to the delivery company to know the condition of his sending. 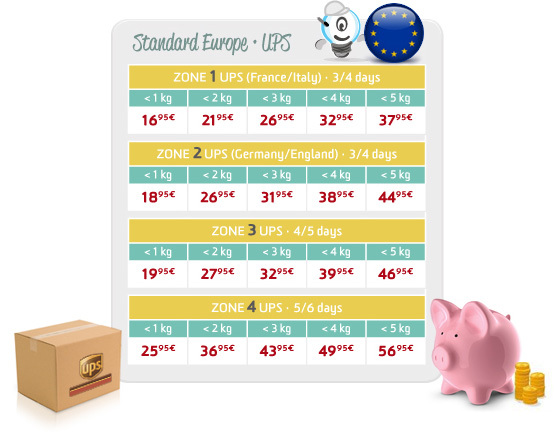 Once indicated a direction, if you want to modify, it will be necessary to pay apart the same cost of sending (The deliveries or carrier companies don´t allow changes on the original direction of sending, and they charge it as a new sending). 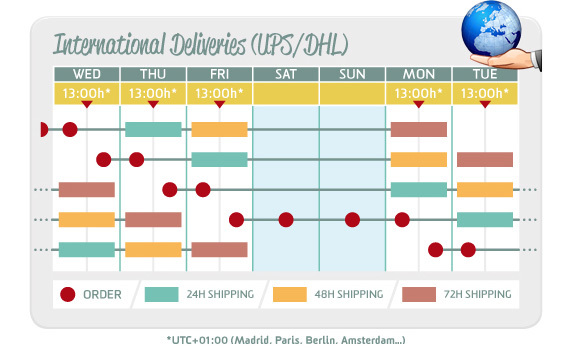 On the observations of the order, it indicates if you have some priority of time to receive the package or any information that could make easier the delivery of the same one. We will communicate it to the delivery company, even trought the time of delivery depends directly on them, and not on us, in spite of we have indicated it to him. - The postage and handling includes costs of packing and manipulation. - The companies of messenger company with which we work do not realize sending to postal boxes. - The price depends on the weight of the products, and on the volume of the package for the international sending. - Before finishing your order, you will have a detailed information of the cost of the same one.